I generally don't like having too many takeaway containers in the house. Sure they are convenient to have around when you need to put some leftovers in the fridge or bring some extra food to the office. But seriously, how many does one need (even factoring in spares for emergencies)? We don't need to generate more waste. Plus those takeaway containers aren't constructed for multiple use and are apparently cancer causing as they emit some carcinogenic chemical when they are overused. Hence, I try to remember to bring my own containers when I go to the nearby hawker centre to buy takeaways. 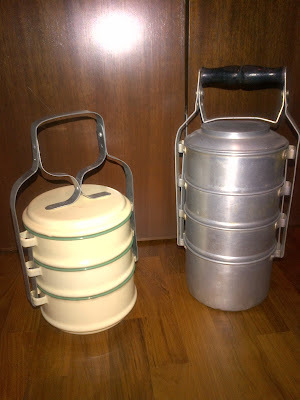 Instead of the retro tiffins of multi-tiers like the 2 I have above, I use a single tier one (since I usually buy a one-dish meal like noodles or porridge) which is made of stainless steel and insulated to keep the food warm. Call it what you may - being green, trying to reduce our chances of cancer, or just not wanting to hoard more useless stuff, I think it is an easy thing to do.